I finally picked up the new Seiko Fieldmaster SBDC011, a field watch in the tuna can body. This is my fourth automatic tuna can after the 6159-7010, SBDX005 and SBDX011. Below is a closeup shot of the dial. 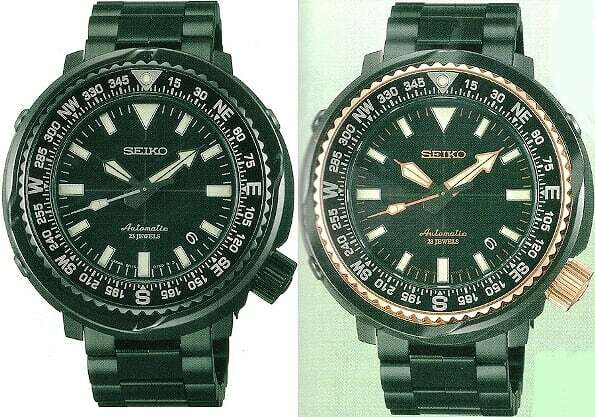 The watch comes with the same type of hour and minute hands that Seiko normally installs on their tuna can watches. The Marinemaster type of second hand though is traditionally not use on the tuna cans. The front portion of the hands have chrome finishing. The short ends are all coated black, probably to minimize glaring effect when reading the time under the sun. The shroud has brushed finishing and is held in place by three screws just like the quartz tuna cans. I do not have a 300m SBBN model here to compare so I can’t say which watch is bigger. The Fieldmaster measures 48mm across excluding crown. The watch is fitted with a flat sapphire crystal with anti-reflective coating. As a field watch, the compass bezel rotates smoothly in both directly (no clicking). From this photo below, you can see that the bezel insert actually slopes downwards toward the crystal. Here’s a close up shot of the crown. I believe it is the same crown used in the SBDX011 except for the different surfacing coating. It looks exactly the same by size or by design. The watch comes with screw in caseback that has the ground to air emergency signal codes printed on it. The watch has an usual lug width of 21mm and is fitted with a double ridged leather strap with double stitching. The colour of the strap actually matches the black dial very well. For your info, this watch uses the standard springbars as opposed to the fat ones used by the Seiko divers. The strap tapers to 20mm and is fitted with a big and solid buckle. Its design reminds me of the Panerai buckle just that it is not as big. Looks like Seiko made a new buckle for the watch and will probably be using it on their future sporty watches. The watch is shipped in the standard Prospex presentation box. It is the same box that the SBDX011 ships in. Now that is a nice watch …how much ? List price in Japan is JPY90,000 (~USD1,044) excluding tax. Actual price depends on how much discount the seller offers. Fat springbars would be good but I guess they chose to put regular springbars there because it is not a dive watch. Great watch! Thank you for showing me in Big Time and the prompt review. I always thought the double ridged leather strip lodd when checking photos in the catalogue. The real thing changed my mind, it looks great! However, leather strap is not my cup of tea. Please show us if you can find another more interesting strap. Nice meeting you at Big Time. The double ridge strap is nice but since the buckle looks a little bit like the Panerai buckle, I will probably put the watch on a Panerai style strap. Great review. I was wondering about the compass bezel. If there are no clicks, then does the compass bezel spin more loosely than a dive bezel? Or is the resistance roughly equal despite the lack of clicks? The resistance is roughly equal to a dive bezel. I believe there is a rubber gasket underneath the bezel that provides the resistance. nice watch review. I plan to get the wAtch bracelet to go with it. May I know which model of bracelet will fit it? This watch comes with leather strap and it will be difficult to get a suitable bracelet because the lug width is 21mm. If you prefer bracelet, I suggest you get the SBDC013 or SBDC015. Thanks for the reply. Say if i go with SBDC011, with lug size of 21mm, what other choices of strap do I have? Technically, any 21mm straight end bracelet would fit but since I’m not a bracelet user, I can say for sure. Google “straight end bracelet” to find out. nice review of the watch. I am not much of a leather strap man, plan to get a bracelet to go with the SBDC011. Could you pls advice which bracelet from Seiko should I get? I doubt the 6R15 will fit into the SBBN015. It is probably thicker than the 7C46 movement. Nice review! I’m new in the world of Seiko watches. I’m very interested in getting a mechanical Seiko tuna diver, but I can’t find any other mechanical tuna diver other than the SBDX011. I’m not prepared to spend that much yet. Do you think this model is a good alternative? The lugs seem short. What’s the lug-to-lug length? This model is an automatic tuna but it is definitely not an alternative to the SBDX011. This is a field watch with compass bezel whereas the SBDX011 is a diver’s watch. The SBDX011 is based on the design of the 6159-7010, a 600m shrouded diver from 1975 and hence it is more collectible. I like the combo too. Thanks. Hi…! I bought a fieldmaster about a year ago. After looking at your watch, I found a difference that is mine doesn’t have a writing Japan 6R15 and Seiko 2 (that writing placed between 5 -7 hour), is there any product policy difference?